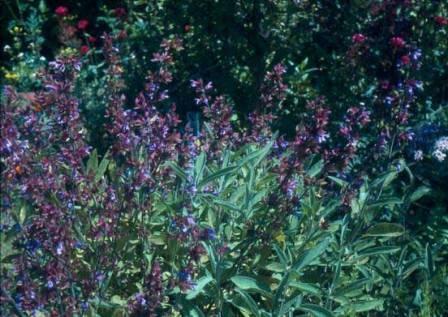 Sage herb comes in several varieties and has been used to season food and perfume soaps. It comes as dried and fresh leaves in addition to essential oils. Although safe when the leaves are used in small amounts for food, the oils may or may not be beneficial. Research is lacking for this particular herb. Animal studies have suggested that sage could increase the risk of seizures in those who are prone to them and could also make it difficult for diabetics to maintain control over their blood sugars. In European folk medicine, it has been used for diarrhea, upset stomach, sore throat, menstrual pain and strains. For a sore throat, 1-4 grams can be used as a gargle 3 times a day but do not swallow. To avoid drug interactions, do not take sage herb if a diabetic or if taking insulin or diabetic type drugs for any reason. This herb interacts with Antabuse so do not use if you are on this drug for treatment of alcoholism. Also, be aware that some preparations may have oils dissolved in alcohol, and if taking antabuse you cannot use any herb prepared this way. Do not use this if pregnant or taking any anti-seizure medications. For more information visit my herb dictionary online.